The director of Belsat TV claimed that their SMM manager got sacked for violating the company’s policy, and that they actually wanted to let him go for quite some time. A Belarusian national, Ivan Shyla, has revealed how publishing a photo of the US and Polish presidents got him fired from his position as a social media manager at Belsat TV channel. "Yeah, I got fired. There wasn’t any discussion, they just kicked me out from all work-related chat rooms and revoked my clearance. Maybe someday I will write about this matter in a more comprehensive fashion, maybe not. … The management shouldn’t apologize, but firing someone because of your own mistakes is not good," Shyla wrote on his Facebook page. The image, which apparently caused Shyla’s sacking, features US President Donald Trump and Polish President Andrzej Duda signing a document during a recent meeting, with Trump glaring menacingly at the camera, bearing an "Apprentice"-style visage, and Duda grinning delightedly as he hunches over to sign the paper. Belsat TV’s head, Agnieszka Romaszewska-Guzy, however insisted that the company already wanted to replace Shyla for quite some time and that the "mocking photo of President Duda" simply became the last straw. 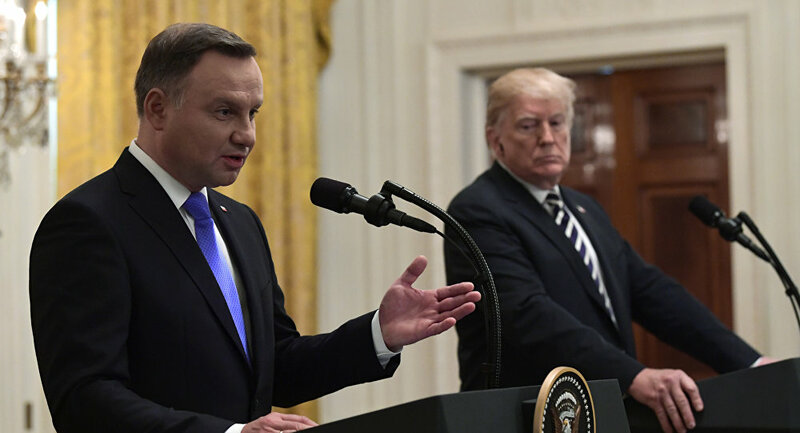 The Trump-Duda photograph evoked outrage among the Polish media and opposition politicians due to the fact that their president was forced to stand while Trump sat. One Polish reporter even remarked that it was "nice on the part of President Trump to move a little, because otherwise our president would have to sign a document on his knees."